Hello my sweet friends! I forgot to tell you about God’s gift to help me settle when my nerves are going nuts. My rambunctious kiddos in tow, we walk to the mailbox and the sun’s rays are beyond the point of refreshing, they are down right blazing. As soon as I stop at the box, my legs feel like spiders are crawling up and down in spastic style. Tonight, I finished over seven relaxing miles on my stationary bike while I caught up on my email. When I was finished I lay on the floor and lifted light weights and did sit ups to work on my abs. As I write this blog, the “spiders” are dancing wildly up and down my calves. In the warm, summer nights, I lay down to bed, exhausted from the long day and my legs are going berzerko! Some call it “Restless Leg Syndrome”. I call it Crazy, Spider Action! Yikes. I do not like this feeling. The first thing I learned to do when my mind is going hog wild and wandering from “Never, Never Land” to “What If” land and my body is spastic and strange and uncontrollable, I change the direction of my thoughts. I pray and when the world is silent and the brain needs to refocus I tune my brain to God’s word. I start remembering and thinking upon every verse I have memorized. Other nights I turn on my You Version Bible App and I just listen to God’s word spoken in a very monotone voice and slowly, slowly my mind stops focusing on negative or nonsense or that which lays heavy on me and I fade off to sleep thinking of truth. The happy man or woman meditates on God’s word day and night (Psalm 1:1-3). The happy man or woman guards his heart and mind for out of it springs the issues of life. Prov. 4:23 That can be translated as “it sets the course of his life”. More on that another day. I started a blog on that last week and haven’t finished it. 😉 Just ponder this with me for a few days, Our thoughts set the course of our life! 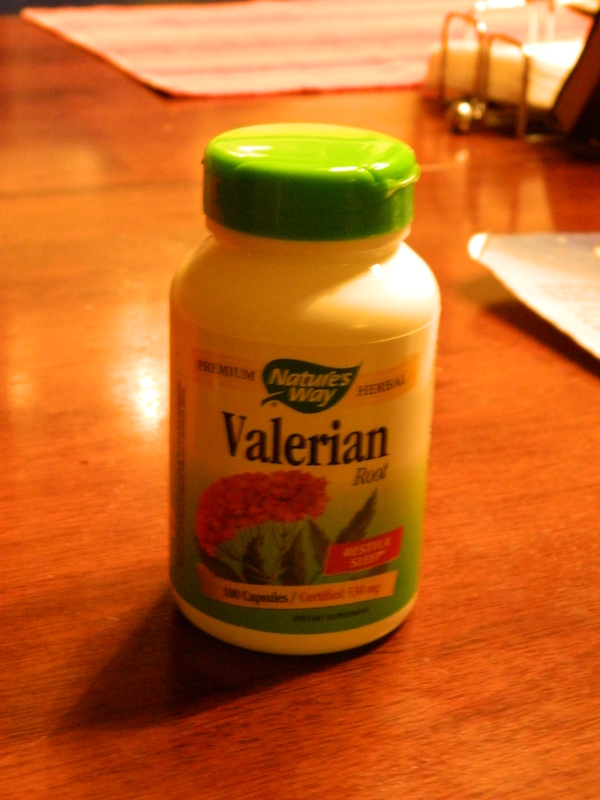 The second thing I use that is God’s gift to me is Valerian Root. Yes, that is me, in the raw. No really. I am sick with a cold and I just got done working out after a long day and no nap but I wanted to show you the real me with water on my shirt and a mess. Hopefully, you will still love me anyway! Here is an up close picture of the brand I have been taking and happy with. I take one of the 530 mg. The pill itself is stinky but this works so very well. 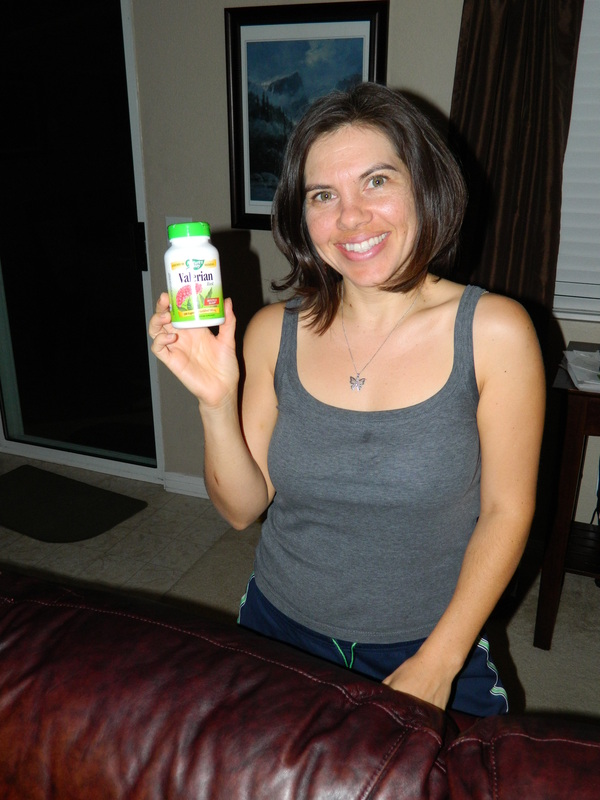 I take it only at bedtime because it is for restful sleep and relaxation of the body. I will be trying the Valerian Root Essential Oil hopefully soon and I will share the results and which one I prefer. If you experience “Crazy Spider Action” or “Restless Leg Syndrome”, what helps you to overcome it? Are there other crazy nerve things you experience? I’d love to hear from you too. We are in this journey together! I haven’t tried anything. I have so many things wrong, I haven’t got to that one yet. Lol. The nerve ablation in my sacroiliac joint I had a month ago sigmificantly helped my pain on my left side. The icing on the cake is that it somewhat helped with my restless leg syndrome on that side. I’m having it done on my right side in about a week and a half, so we’ll see how it goes. I’ve never tried Valerian Root. I’ll have to ask my doctor about it the next time I see him. Hi Marianne Sue! I am so glad to hear that the procedure helped you! How wonderful! I pray that it helps the other side as well. I pray for you to have wisdom on what is best for your body. Some doctors are not aware of natural benefits of herbs and God’s nature. Please read my last entry as well. It shares lots of different things that help. I am praying for you Sweetie. May God be your strength in this journey. Thanks for the info! I’ll have to try Valerian root. The only thing that helps me so far is stretching my legs, if I don’t, I can’t sleep. It used to only happen during pregnancy, but after my last one, it is every night. Crazy spiders…exactly!